A pool house or cabana can transform your pool area into a luxurious outdoor living space that is not only ideal for entertaining, but is also a practical complement to your home that can simplify your life. A pool house, complete with a guest suite for summer visitors and a bathroom to accommodate the kids, is not just an addition that fills up space alongside your pool. A pool house can also serve as a place to enjoy lunch or freshen up and change, without ever needing to venture into the house. It might even feature a five-star kitchen, a chandelier and a fireplace. Before taking the step, you should make a list of intended uses for your pool house or cabana. It’s a good idea to consult a pool professional during this process, because they have the experience to offer suggestions on what’s important for your new structure. 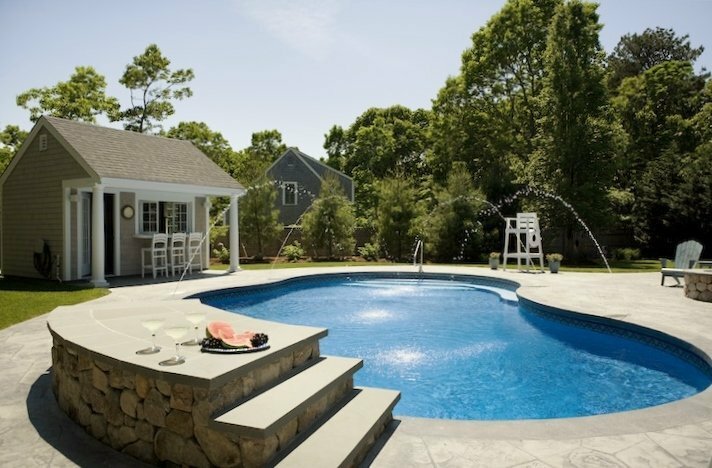 At Shoreline Pools, we can act as your general contractor to oversee the project and to bring in trusted partners who will make your dream a reality. During the process, we will also check city and county building codes to make sure the size, design and location of your pool house meets zoning requirements. A pool house can be as elaborate as you like. It can include a bar, a bedroom and a bath, a game room and a second kitchen. In many ways, it can be a second house on your property. If you’re a hostess with the “mostess” who likes to serve food and drinks, consider adding a sink and mini-refrigerator, with ample counter space. And why not wire the pool house or cabana for sound, television and even Wi-Fi? Think of movie time with the kids or the Super Bowl with friends. The term “cabana” is often used interchangeably with a pool house, but some cabanas can be built with a three-sided roof designed to provide shelter and privacy, while others feature both an open-air and sheltered feel. But most cabanas contain four posts and a roof and are designed to shelter living room furniture, and perhaps a fireplace or a kitchen. Whichever you are planning, the pool house or cabana should blend into the overall landscape. It’s important that they provide views from both indoors and outdoors, and that they enhance the surrounding landscape. Also, placement of the outdoor lighting on the façade of the pool house is important. You want subtle, ambient lighting that creates a soothing atmosphere. Your choice of exterior décor can significantly impact the visual appeal. Flagstones can be laid to create a walkway to the door, while trellises, wind chimes, weather vanes and birdhouses are all nice touches. Where to position the pool house or cabana is also critical if you want to get maximum benefit from your investment. It will always be a major focal point, so you want the structure to be visually appealing and to blend seamlessly into the home’s architecture. When determining the placement, it’s a good idea to preserve as many trees as possible. They can provide the perfect background and create privacy from neighbors. You should also consider how to maximize sunlight, if you’ll need to run electricity out to the structure, and the pros and cons as the seasons change. The surrounding foliage can be quite different from spring, summer and fall. During that time of year when the horseflies or mosquitos are out, a pool house with a front screened porch can make all the difference. Whether you choose an elaborate, luxurious pool house/cabana or an elegant, yet simple one, we at Shoreline can guide you through the process and help you create an outdoor living space that perfectly matches your needs.